Pre-service and in-service elementary teachers tend to have poor attitudes and beliefs about science that stem from their own early science-related experiences. The development of positive dispositions toward science among pre-service teachers is problematic but essential if we are to improve science education. Attitudes will affect behavior and positive attitudes among pre-service teachers will lead to good learning and subsequently to good science teaching. Previous studies suggest college science courses that contain elements of inquiry-based learning, practical application to teaching, and engagement with broader real-world issues can affect positive change in these dispositions. [more] Here, I report on the efficacy of a new biology course at Longwood University in improving science dispositions among pre-service teachers. The course, modeled on a SENCER (Science Education for New Civic Engagements and Responsibilities) approach, engages students in biological concepts using focal topics that involve timely, complex, and biologically relevant issues confronting society. Four semesters of assessment data demonstrate a favorable change in students’ attitudes toward science, science teaching, and engagement in broader civic issues after completing the course. Wanted: College and university science teachers wishing to become engaged in a comprehensive, important, and potentially transforming educational movement. Those who accept the challenge will join with K–12 teachers in a quest to give every American an essential understanding of the physical and biological processes that characterize our world, and to nurture curiosity and scientific habits of mind. In the process, all participants will experience change and renewal. This opening paragraph of “College Pathways to the Science Education Standards” (Siebert and McIntosh, 2001), both highlights the critical need for systematic consideration of science education in higher education but also identifies one of the greatest obstacles to holistic change: the cyclic nature of our educational systems. Teachers often teach as they were taught (Watters and Ginns, 2000), and thus meaningful and positive change is required not only to improve scientific understanding of all citizens but also to affect the “pipeline” that develops future K–12 teachers. Pre-service and in-service elementary teachers, in general, tend to have poor attitudes and beliefs about science and their capacities to be effective teachers of science (Stevens and Wenner, 1996), and many experienced teachers report feeling uncomfortable and unqualified to teach science (Kahle, Anderson, and Damjanovic, 1991). Research suggests that these attitudes develop as a result of their own science-related experiences in elementary and high schools (deLaat and Watters, 1995) and support the teacher preparation pipeline problem: a student’s interest in pursuing science is shaped by experiences at a young age and his/her most frequent exposure to science is through those teachers. While these pre-service and in-service teachers often have a love for the profession of teaching, they may lack a passion for or real connection to the science content. Given this situation, the development of positive dispositions towards science and science teaching among pre-service teachers is problematic (Watters and Ginns, 2000). If we seek to change this cycle by impacting the preparation of our future K–8 teachers in their science courses in higher education, we must accept some of the constraints of our own systems. In most college and university science departments, courses are taught by disciplinary experts who may have little or no formal training in teaching or science education. As such, at the college level we have the same issues as at the K–8 levels but in reverse: faculty with a love for the content but who may not be prepared to or comfortable with modeling and teaching pedagogical approaches for these teacher candidates. How then can we seek meaningful change in the preparation of K–8 teachers while working within the higher education systems, neither overwhelming faculty with proposed changes nor selling short our future teachers on the content and context they need to successfully teach their own students? My research in this area supports the utility of the SENCER approach (Science Education for New Civic Engagements and Responsibilities) as a way to reform science courses in higher education and positively impact teachers. SENCER (2009), a national initiative funded by the National Science Foundation and housed at the National Center for Science and Civic Engagement at Harrisburg University of Science and Technology, seeks to improve learning and stimulate civic engagement by teaching science through complex, largely unsolved civic issues that interest large numbers of students. In this paper I present survey data collected in a SENCER-styled course for pre-service teachers at Longwood University. The survey was designed to assess the efficacy of this course in improving dispositions that lead to increased student learning of science concepts, greater confidence in teaching science, and enhanced engagement in broader civic issues. The underlying idea of this study is that attitudes will affect behavior and that positive attitudes among pre-service teachers will lead to good learning and subsequently to good science teaching. Longwood University has a long tradition of developing teachers, and until 1975 was an all-female institution with a predominant focus on teacher education. Today, pre-service teachers continue to make up the largest major program on campus (approximately 750 of 3900 undergraduates). The home for these pre-service teachers is the Liberal Studies program in the Cook-Cole College of Arts and Sciences. This program seeks to provide a strong Liberal Arts content background to pre-service teachers before they begin their formal training in education. In addition to their required General Education science course, students within the Liberal Studies program who are seeking elementary licensure (grades K–6) are required to take four science courses: one two-hour physics course, one two-hour chemistry course, one three-hour earth science course, and one four-hour biology course. Students electing to obtain certification to teach science at the middle school level (grades 6–8) have the additional requirement of selecting General Chemistry 101 as their general education science requirement. The Fundamentals of Life Science, Biology 114, is a required science course for all of Longwood’s Liberal Studies majors and is the only life science course they are required to complete in preparation for their teaching careers. As a four-credit hour course, students participate in three hours of lecture and two hours of laboratory each week. The course was first offered in the fall of 2004 following a curriculum change to science requirements in the major; prior to this term, students seeking K–8 teaching licensure were required to complete four-credit courses in zoology and botany. These courses were taught using a traditional lecture-lab format. As the primary instructor for the new course, I had the opportunity to design a new course model. Building on student feedback from previous courses, relevant pedagogical research on the effectiveness of topic-focused and inquiry-based approaches (Korb, Sirola and Climack, 2005; Crowther and Bonnstetter, 1997), and my department’s involvement in the SENCER program, I structured Biology 114 around a number of focal topics. These topics involve timely, complex, and biologically relevant issues confronting society. Students are engaged in these topics from the start and are required to reflect on and inquire about these issues throughout the course. For example, we spend several weeks engaging the topic of cancer, a subject that most students consider interesting and important and one with a rich civic context. To build student interest in the topic, they are assigned context readings beforehand. These may be cancer survivor stories or articles on new treatment technologies. Along with discussions and reflective writing assignments over these readings, students analyze recent trends in cancer rates and are asked to generate hypotheses explaining them. Students then test their hypotheses, in effect, by writing a brief research paper that explores recent research related to the hypotheses. While engaging this topic and its broader impacts on society, students learn important biological concepts such as cellular chemistry, cell division, DNA structure and function, and cell regulation. Other focal topics follow to sustain student engagement and interest in class and in their learning; these include genetic engineering and the stem-cell debate, HIV-AIDS, drug and alcohol abuse, human overpopulation, and the biodiversity crisis. Each topic is introduced with context readings and analysis of relevant statistics and data. Interest is sustained through additional readings, discussions, relevant news clips and videos, and short reflective writing assignments. While these focal topics function as umbrellas under which students learn much basic science content and make connections to live as citizens, they are also required to synthesize the material in the specific context of their chosen profession. Students are further prepared for work in their future classrooms by participating in active, inquiry-based laboratories and through a novel assignment that requires them to reflect on biological content covered throughout a focal topic and then locate relevant K–8 Virginia Standards of Learning (SOLs)that apply to the specific content (Virginia Department of Education, 2007). This encourages students to consider and make connections between the college-level concepts learned in class and the K–8 content they will be teaching in the future. 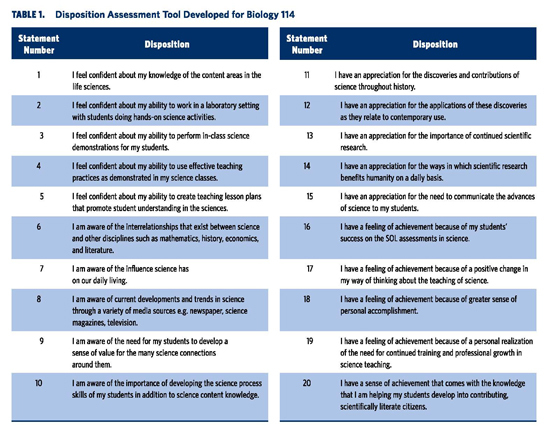 To evaluate change in pre-service teachers’ dispositions I constructed a survey composed of twenty statements designed to assess attitudes related to science and the teaching of science at the K–8 level (Table 1, below). Students were asked to reflect on their level of agreement with each statement and respond using a Likert scale (Edwards, 1957), where 1 = strongly disagree, 3 = neutral, and 5 = strongly agree. The twenty survey statements were constructed around four categories focusing on different dispositions and capacities. Statements 1–5 addressed students’ level of confidence in their science content knowledge, science process skills, and ability to teach scientific concepts. Statements 6–10 assessed students’ awareness of the importance of learning and teaching science in a greater societal context. Statements 11–15 assessed students’ appreciation of scientific contributions to society and the importance of scientific research. Statements 16–20 addressed students’ feelings of achievement related to their personal development in how they think about science and science teaching. Additionally, students were solicited for comments regarding their feelings or attitudes about science in general and their ability and desire to teach science in their future classrooms. The assessment plan and protocol was approved by the Human and Animal Subjects Research Review Committee of Longwood University prior to the initiation of data collection and was renewed annually. Students were informed of the study, assured the anonymity of their responses, and provided the option to participate. The disposition assessment and solicitation of comments were administered on the first day of class and again during the last week of class for four consecutive semesters (fall 2005, spring 2006, fall 2006, spring 2007). Of 309 students enrolled in the course during this period, 91 percent (n = 281) participated in the pre-course assessment and 84.5 percent (n = 261) in the post-course assessment. Of the participants completing the pre-assessment, 12.8 percent (n = 36) provided pre-assessment comments while 15 percent (n = 39) provided post-assessment comments. The student population in Biology 114 was predominantly underclassmen and female (95.8 percent). The majority of participants (84.6 percent, n = 238) planned to start a teaching career in the K–6 grade levels. Survey data were pooled from all four semesters into pre- and post-assessment groups. For this report on the project to date, I calculated means and standard errors of student responses to nineteen survey statements. One survey statement (number 16) was omitted from all analyses due to relevancy of the statement to the survey population. I also compiled summary data by disposition category and report pre- and post-assessment means of scores and the mean change in pre- and post-assessment scores by category. Pre-service K–8 teachers participating in the Biology 114 pre- and post-course disposition assessments demonstrated a favorable change in their general attitudes toward science and science teaching. The mean of scores reported by students increased for all nineteen survey statements between the pre- and post-assessment (Figure 1). The largest positive mean change in response between pre- and post-assessment occurred in the personal achievement category (mean ∆ = 1.13), indicating participants felt more positive in their personal development of how they think about science and science teaching after completing the course (Figure 1). The second largest mean change in student response was in the category addressing students’ level of confidence in their science content knowledge, science process skills, and ability to teach scientific concepts (mean ∆ = 0.88). I also found consistent improvements between pre- and post-assessment comments regarding participants’ feelings or attitudes about science in general and their ability and desire to teach science in their future classrooms. Students also responded favorably in post-assessment responses to the SENCER-style approach of the course. A representative sample of these comments is provided in Table 2. During the pre-assessment, 6.4 percent (n = 18) of participants indicated a career plan that included obtaining middle-school science licensure; in the post-assessment, that percentage had increased to 8.9 percent (n = 23). Recent research suggests that college science courses that contain elements of inquiry-based and hands-on learning (Palmer, 2001), practical application to teaching (Korb, Sirola and Climack, 2005), and engagement with broader real-world issues (Middlecamp, Phillips, Bentley, and Baldwin, 2006) affect positive change in undergraduate students’ dispositions toward science. This preliminary study of the outcomes of Biology 114, a course that incorporates each of these elements in a SENCER teaching approach, lends further support to these positive effects on pre-service teachers. Though the recorded changes were uniformly positive in four semesters of data collection, the means and degrees of change varied among disposition categories. 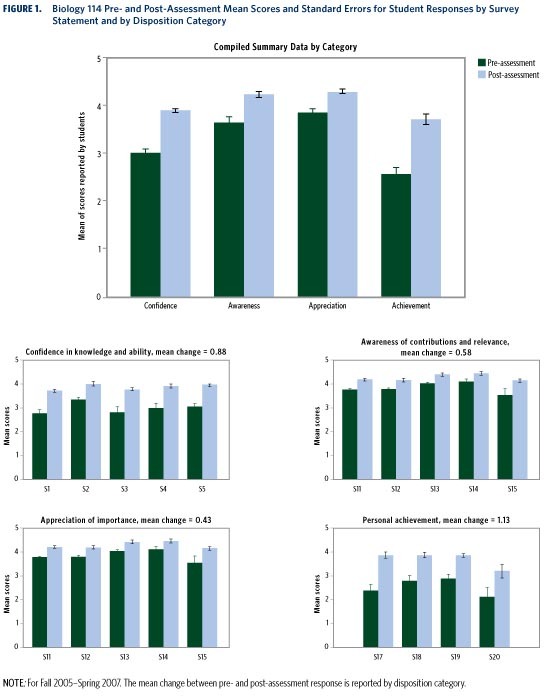 Students’ self-reported feelings of achievement related to their personal development in how they think about science and science teaching (statements 17–20) showed the most change, while student confidence in their science content knowledge, science process skills, and ability to teach scientific concepts (statements 1–5) showed the second greatest change. These results demonstrate the course was successful at improving students’ confidence in their science abilities, which should translate into a more positive attitude toward teaching science in their own classrooms (Young, 1998). Interestingly, though still positive overall, there was less cumulative change in dispositions related to students’ awareness of the importance of learning and teaching science in a greater societal context (statements 6–10) and in dispositions related to appreciation of scientific contributions and the importance of scientific research (statements 11–15). Mean scores for pre-assessment responses to statements in these two disposition categories were higher than were the mean scores for pre-assessment responses in the former two categories. 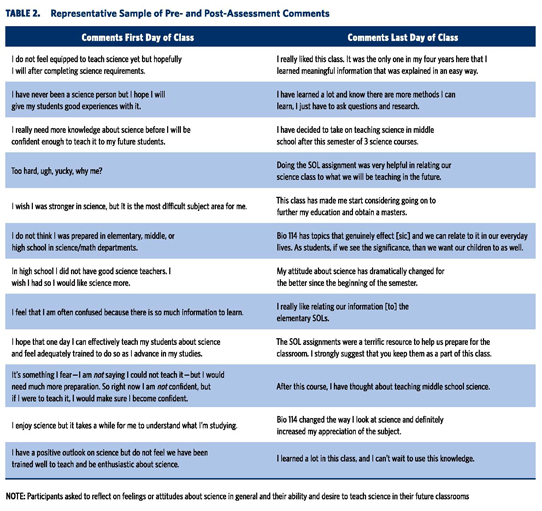 Relatively high responses to pre-assessment statements in these categories suggest students entered the course with at least a perceived awareness and appreciation for the contributions and relevance of science. Exposure to intense media coverage of many controversial and capacious issues involving science may foster student perceptions of being informed and aware of these specific issues. This response trend may also be related to students’ previous science experiences, a possible covariate that will be explored in future analyses. The amount of change between pre- and post-assessment mean of scores reported by students increased over the course of four semesters. In fact, in consecutive semesters, students responded increasingly more positively to post-assessment survey statements in all four disposition categories. This temporal trend of improvement in science dispositions likely reflects the time required to develop and refine course content and context in this SENCER model. This consideration is important for others wishing to adopt this pedagogical approach. Informal discussions with students further support post-assessment comments that students appreciated making science content relevant to teaching and to everyday living experiences: they find worth in studying science when they recognize it relates to their life and profession (Korb, Sirola and Climack, 2005). Many students found it challenging to match course content to K–8 SOLs and then provide a rationale for those connections, especially with the more abstract or complex college-level concepts that had no obvious K–8 counterpart. As these assignments had direct connection to their future teaching, students found them useful and helpful, even if difficult (Table 2). For an instructor with little formal training in teaching methodologies, these structured assignments provided an intentional link between content and teaching; yet by placing the burden on the students to make and justify their own connections to elementary course content, I was able to maintain class focus on subject content and context instead of on teaching methods. Future plans for this endeavor include a continuation of the assessments in Biology 114 and discussions with colleagues on expanding the use of the pedagogical methods discussed here to other science courses required in the Liberal Studies major program. Also, as this dataset grows, I will examine the roll of covariates on assessment responses; factors such as the number of previous science courses the student has taken prior to Biology 114 and the grade level the student plans to teach may function to determine the degree of change in assessment responses. Additionally, I intend to broaden the use of these assessments to test the hypothesis that dispositions toward science, science teaching, and civic engagement continue to improve, first, as pre-service teachers move into their pre-professional education training and second, as new teachers gain actual experience in their own classrooms. Biology 114 continues to evolve as a course as I modify content and context to reflect new trends and research in focal areas and discover alternative ways to engage future teachers in biology and science teaching. Future teachers who enter the workforce with an appreciation of and sense of excitement for the sciences will help to break the cycle and ensure that our children leave school with a better understanding of our world and the immense challenges and opportunities we face. This research was supported through an Educator Preparation Program Effectiveness Grant from Longwood University’s Professional Educator’s Council. I thank my colleagues, Dr. Enza McCauley, for providing her guidance and expertise in the development of the assessment tool, and Dr. Alix Fink, for her encouragement and advice on the challenges and rewards of teaching through focal topics. Dr. Mark Fink is an Associate Professor of Biology at Longwood University. His research at Longwood focuses on basic and applied questions relating to the ecology of birds. His current research focuses on aspects of avian reproductive ecology and understanding the impacts of habitat alteration on reproductive success and population dynamics of early-successional birds of the Virginia Piedmont. He is also interested in pedagogical questions relating to how undergraduate students, especially pre-service teachers, best learn science concepts and appreciation. He is currently examining the influence of existing science courses at Longwood University on dispositions toward science and science education among pre-service and in-service K–8 teachers. Dr. Fink has been at Longwood since 2001. He has a doctoral degree in biology from the University of Missouri and Master of Science degree in wildlife and fisheries science from Texas A&M University. Crowther, David T. and Ronald J. Bonnstetter. 1997. “Science Experiences and Attitudes of Elementary Education Majors as They Experience an Alternative Content Biology Course: A Multiple Case Study and Substantive Theory.” In Proceedings of the 1997 Annual International Conference of the Association for the Education of Teachers in Science, Peter A. Rubba, Patricia F. Keig, and James A. Rye, editors, 177–206. Cincinnati, OH: Association for the Education of Teachers in Science. deLaat, Jenny and James J. Watters. 1995. “Science Teaching Self-Efficacy in a Primary School: A Case Study.” Research in Science Teaching 25 (4): 453–464. Edwards, A.L. 1957. Techniques of Attitude Scale Construction. New York: Appleton-Century-Crofts. Kahle, Jane Butler, Andrea Anderson, and Arta Damnjanovic. 1991. “A Comparison of Elementary Teacher Attitudes and Skills in Teaching Science in Australia and the United States.” Research in Science Education 21(1): 208–216. Korb, Michele A., Christopher Sirola, and Rebecca Climack. 2005. “Promoting Physical Science to Education Majors: Making Connections between Science and Teaching.” Journal of College Science Teaching 34 (5): 42–45. Middlecamp, Catherine Hurt, Margaret F. Phillips, Anne K. Bentley, and Omie Baldwin. 2006. “Chemistry, Society, and Civic Engagement (Part 2): Uranium and American Indians.” Journal of Chemical Education 83(9): 1308–1312. Palmer, D.H. 2001. “Factors Contributing to Attitude Exchange Amongst Preservice Elementary Teachers.” Science Teacher Education 86: 122–138. SENCER: Science Education for New Civic Engagements and Responsibilities. 2009. http://www.sencer.net (accessed December 12, 2009). Siebert, Eleanor Dantzler and William J. Siebert, eds. 2001. College Pathways to the Science Education Standards. Arlington, va: NSTA Press. Stevens, Carol and George Wenner. 1996. “Elementary Preservice Teachers’ Knowledge and Beliefs Regarding Science and Mathematics.” School Science and Mathematics 96(1): 2–9. Watters, James J. and Ian S. Ginns. (2000). “Developing Motivation to Teach Elementary Science: Effect of Collaborative and Authentic Learning Practices in Preservice Education. Journal of Science Teacher Education 11(4): 277–313. Virginia Department of Education. 2007. “The Virginia Standards of Learning, K–12.” http://www.doe.virginia.gov/VDOE/Instruction/sol.html (accessed December 12, 2009). Young, Tricia. 1998. “Student Teachers’ Attitudes Towards Science (STATS).” Evaluation and Research in Education 12(2): 96–111. Please click the link above to download a PDF copy of the above article.